The Founding Fathers—men of property all, and committed to preserving and enlarging its advantages. Most of us are proud of being Europeans or descendants thereof. Yet the mythical Europa eloped with Jupiter, who, for the purpose, assumed the shape of a white bull, for whom she had developed a penchant. A type of relationship most of us would not entertain, unless they are postmodernist cultural Marxists and followers of the Frankfurt school. In the Middle Ages the myth was the Fall in the Garden, followed by the redemption from the Fall through the Son of God, and the redemption of man through the sacraments. Protected by the medieval castle, the cathedral was the center of the sacrament. The Reformation, the ensuing wars of religion and capitalism displaced the medieval myth. The growth of the large European states, notably France, Spain, and of course England, called for another myth – that of the king, directly anointed by God. Revolutionary America could not replace George III with another king, though some considered the idea. Imbued with the spirit of the (French) enlightenment, and sharing in the resurrected popularity of legends, leaders and lore of the ancient Roman Republic, the Founding Fathers converted that spirit into words. As I said, once we recognize the intrinsic power of myth and leave it untouched, we may take the liberty of examining its actual rendition in real life. In truth, when the Founding Fathers drafted the Constitution, they replaced the old with a new authority, the old monarchy-inspired ruling class with a new republican ruling class, resting on property, social distinction, and very quickly on heredity too, as much as the old one had done. For on sober second thoughts, the Founding Fathers decided to modify the wording. To make a myth out of the protection of property is almost to reduce a republic to an institution for the prevention of pilfering. And to assume that all citizens at large are endowed and imbued with the soul and the spirit of shopkeepers, loan sharks, pawn brokers and used-car salesmen. For indeed, where everything is for sale, “to things of sale, a seller’s praise belongs,”(2) and so does the protection of things sold. British law was already acutely keen towards the protection of property. Unsaid but subsumed in the ‘protection of property’ was a brand new land-grab from the natives, in a brand new world of limitless capitalism. Accredited historians say that Jefferson proposed to substitute happiness for property in the Declaration – a small detail in itself but it fits his persona and attitudes, as they transpire from his writings and actions at large. Next, we can perhaps take it in stride that ‘all men are created equal,’ less the slaves because they were not human, the original inhabitants, for they were not Europeans, women for they were not men, and the poor and illiterate who could not vote – even though they would be called-on to do the fighting in the war of independence. But it was in Europe that the declaration of independence raised an epidemic of enthusiasm – for the distance of an ocean erased the bound between reality and myth – a myth that, in Europe, had an almost pre-Marxian ring, without the sting of a class struggle. Here are two sample extracts of Europe’s view of America in the last quarter of the 18thcentury. Nevertheless, the Frenchman’s description of the American Congress is no more unrealistic than, for example, today’s CNN’s renditions, omissions and interpretations of current events. A Washington who refuses to be a king is more real than an American prompted by Russia to vote for Trump rather than Hillary – a tale that CNN and others still peddle with shameless obtuseness, insulting contempt for their audience, and uncaring transgression of the bounds of probability. Yet, in the historic utopian enthusiasm for the American Revolution we sense the psychological discomfort of Europeans, their yearning to live in a better country that would recognize the higher aspirations of her citizens. We equally sense the moral rejection of existing European society – which was the ultimate cause of the (French) revolution, however eventually questionable the results of that revolution proved to be. Eighteen century’s scholars-of-the-road and readers of pamphlets believed that in Europe talent was a futile gift, whereas in America the most honest and the most respectful was also the greatest and most respected, without reference to birth or rank. In America there were (supposed to be) none of the social injustices that weighed heavily in Europe, not because they were getting heavier, but because people had become aware of them. There were some who tried to correct the most absurd ideas about America, then circulating in Europe – Jefferson for example, when he lived in Paris as ambassador of the United States. But some Europeans still preferred dreams to reality, or perhaps understood that, to affect reality, only dreams can furnish the striking material. A clear case where the plodding citizen, the budding philosopher and the frustrated intellectual had allowed their imagination to give shape to forms of things unknown(3), by giving them a local habitation in the realm of wonderland. It was frustration translated into boundless hope. A feeling, still, that produced a significant discontinuity in the philosophy of history, and the belief that the American Revolution marks an enormous turning point in the entire history of the human race. Beliefs and traditions have long tails. Those interested in the origins of beliefs may trace the often-quoted “American Exceptionalism” to the mythical perception of the Founding Fathers, as imagined from across the pond. Even allowing that it is easy to entertain a false opinion of one’s own excellence, and that a questionable claim of national superiority may serve excellently as a transient expedient in a campaign of pre-electoral popularity. But then what does “the pursuit of happiness” mean or meant then, besides being a good-sounding lexical tool? For the “pursuit of happiness” replaced the “the protection of property,” a principle implicitly assumed, though temporarily moved to back-stage, behind the curtain of decency and away from the ostentation of impudence. The answer is ‘little’ unless, perhaps, we briefly meditate on an overlooked difference – namely, the difference between the laws of biology and those of economy. In economy, the fundamental principle of operation is competition. In biology the fundamental principle is what experts call symbiotic resonance. That is, all the components of the human body, to work well together, must be in sympathetic resonance with each other. Illness, broadly speaking, is a state when the resonance among biologic protagonists is altered and disrupted. But economy has built itself with laws different from biology. With economy the fundamental principle is competition, which is the exact contrary of resonance. Such fundamental dichotomy is the source of the social pathologies we are prone to lament, and from which some seek partial relief in the mythology of the Founding Fathers. We will not touch here on the two cherished doctrines of classical economics – that the self-interest of the capitalist coincides with the interests of the community, and that the competitive system provides the dynamics of economic progress. According to Marx, humanity is still in a prehistoric psychological state. To create a proper humanity, its components must resonate among themselves. A regime based on resonance among humans would mirror the requirements of biology. In a competition-based system – now risen to the level of unrestrained, neo-liberal, reactionary, militaristic turbo-capitalism – the problem of health and happiness at large can never be properly addressed. Furthermore, the spokesmen of content know very well that the substance must not be allowed in the way of the shadow – it’s a cardinal commandment of politics. And sundry regime psychologists can invent fine-sounding verbal palliatives (and actual pills), as defensive countermeasures. But pills and palliatives are worse than useless when, for example, applied to a patient who finds himself fired from the company operating in a competitive model. This is in no way an indirect apology for Marx’ theories. For when Marxist self-styled practitioners put his theories into practice, in the 1917 Russian Revolution, the result was a regime where the state became the supreme capitalist – a solution appealing perhaps to some, and to the unreasoning phantasy of others, but unlikely to mirror the principles of symbiotic biology. Let’s now return to the Founding Fathers and to what they founded. 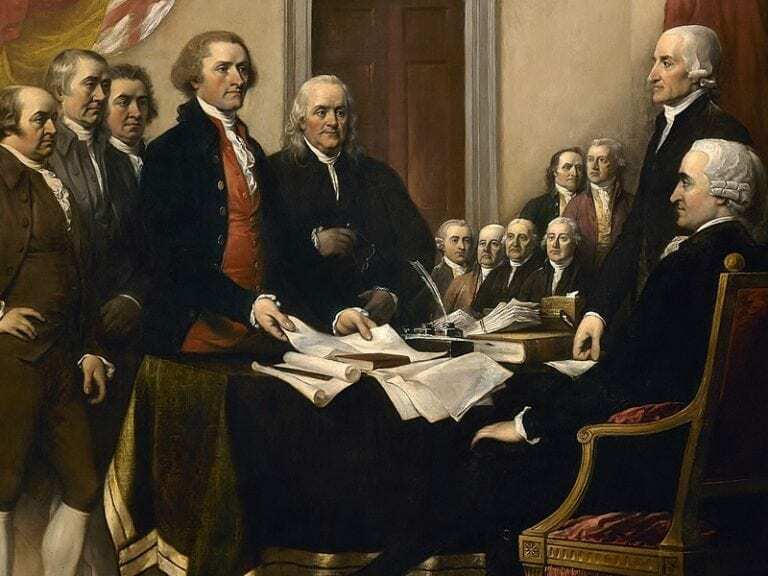 The original Founding Fathers are those who signed the Declaration of Independence. Are the Founding Fathers of Independence also the Founding Fathers of the Constitution? However, in the current currents of this world, many refer to the Founding Fathers for support of their point of view and for disparaging comparisons with today’s politicians and their actions. In this context the distinction between ‘Fathers’ and ‘Framers’ is irrelevant. ‘Founding Fathers’ in practice means, “the fathers of the nation and/or framers of the Constitution, who would say what I say and think as I do, if they were to come back to life.” A proposition naturally considered a tale by those who do not share the view of the critic. Considering that Jay himself handsomely benefited from independence, in remuneration and honors, there is little reason to doubt his statement. Prior to the start of the actual war, orators stirred the crowds with exhortation about dying for freedom – with others doing the dying, of course. For, as never before, so many Americans enjoyed the opportunity of getting rich quickly. Contractors, speculators and swindlers exploited the need of provisions and tools of war for a quick profit. When a ship anchored at port, the speculating patriots quickly bought the cargo and stored it until prices reached the desired level. Someone may have pointed out to the General that he was fighting for the “inalienable right” of the “protection of property,” – the property of the merchants in the instance. But historically, logic has rarely agreed with politics. Through the War of Independence, recorded or reported instances of peculation rather than patriotism are so many that their listing would quickly annoy even a patient reader. We may safely conclude that the type of freedom that Americans were prompted to die for, was another tale. The debates and the politics that led to the framing of the Constitution bring better to the fore what the war of independence was all about. For when the fighting ended, a conflict developed in the American camp between moderates and radicals, between the conservative and the party of change. It was a revolution after the revolution was over. To one group belonged the early revolutionary leaders who went to war to get independence. The leader of this group was Thomas Jefferson. They liked the Articles of Confederation, agreed upon during the war, because they embodied the conviction that the greatest political gain in the revolution was the independence of the several states. The weaker the confederation, the more independent the states were bound to be. Opposing the radical independentists, as we could call them, was a group of men who, originally, came into the revolution more reluctantly – the Federalists. The leader of this group was Alexander Hamilton, whose image daily shows up in the 10 dollar bills of the readers. They wanted a central government with power to coerce the individual states and their citizens. We could say that they were men of principle and men of property, whose property provided their major principle. Merchants, speculators and businessmen of all kinds readily agreed with the Federalists, considering that the boom of the war was followed by the bust of peace. Furthermore, thousands of small farmers, tradesmen and craftsmen were faced with the loss of everything they owned. Tax farmers and debt collectors, accompanied by guards, would not accept in payment the “Continental Dollar” issued during the war, nor the Certificates issued to the soldiers. Collectors demanded hard metal coins, unavailable to the ex soldiers. Whereupon they would then seize the debtors’ cattle and agricultural implements. In the fall of 1786 a group of Massachusetts farmers attempted a rebellion, led by Daniel Shays, a war veteran, wounded during the war of Independence. For the record and for his bravery, he had even received a sword directly from the hands of the ubiquitous and transcontinental French hero Lafayette. Shay’s “little rebellion” profoundly influenced the making of the Constitution. James Madison said that the shock waves, produced by this ‘blind lurch towards radicalism,’ contributed more to the Constitution than any of the political or economic inadequacies of the Articles of Confederation. Relieved at the escape from a however improbable anarchy, the representatives of America’s new aristocracy assembled in Philadelphia to form the famous “more perfect union,” enshrined in the Constitution. Proving that the rich and famous can even get away with lexical errors, along with murder, crimes and misdemeanors, as proven by recent history. And the Founding Fathers equally succeeded in making the nation safe for profits and property. How was the danger to be avoided? – asked The Federalist, having the answer at hand. It is redundant to say that the “chosen body” meant the rich and famous and/or the minions at their beck and service. There you have it, the philosophy, the principle and the rationale for all reactionary policies and subsequent wars, including the most recent, where the “public views” have been “refined and enlarged” by the rich, the famous and the Zionists. An America divided between patriotism in the service of the captains of war, and commerce in the service of the captains of banking. Indeed, the reasons alleged by the Federalists were no doubt convincing to those who were ready to be so convinced. But those reasons were and are, after all, more plausible at first sight than on reflection – if we only just attempt at least a minor reconciliation between the laws of biology and the laws of current economics. Of course, the spokesmen of content will deny that the Constitution was designed to protect the rich. But the reason for such denial is the need of it. Few can look into the seeds of time and say which grain will grow and which will not(4). But we can speculate that if the Jeffersonian views, based on the Articles of Confederation, had prevailed, America would be different. How and to what extent, is of course, anybody’s guess. Still, the sanctimonious reasons printed in “The Federalist” to justify the predominance of the rich and famous, can equally be added to the file of tales referred to in the title. The deeper dilemma, whether those who succeeded in destroying the Articles of Confederation were “Founding Fathers” or lieutenants of the power of darkness, can only be answered depending on individual convictions. We may conclude this brief historical excursus by returning to a persistent and unanswered question, embodied in the Declaration of Independence. The document enshrined, as we saw, the right to the pursuit of happiness, but failed to describe what happiness actually is or consists of. Most of us would equally hesitate to give an answer – hence we can absolve the Founding Fathers for having given none. And we may reflect that much of our life must be passed in affairs considerable only by their frequent occurrence. And much of the pleasure that our condition allows, must be produced by giving elegance to trifles, be it the nurturing of a rose, the reading of a book, or even the implementation of an appetizing recipe. A prospect unlikely to trigger enthusiasm or exhilaration in many, but perhaps consonant with the views of those who maintain that every human is but a quintessence of dust(5), randomly assembled from minute particles of ancient stars.